Home to Hockey Night in Canada, the Hockey Hall of Fame, Don Cherry and the storied Leafs, Toronto is indeed the centre of the hockey universe. But did you know . . .
Before becoming the Maple Leafs, the franchise had several names, including the Torontos, the Arenas and the St. Pats, and the team’s first games were played in the long-gone Arena Gardens. The Toronto Maple Leafs might never have come about if the legendary hockey czar Conn Smythe hadn’t been fired by the start-up New York Rangers. And why were the Rangers practicing in Toronto and not New York? Maple Leaf Gardens came into existence only after Depression-era construction workers agreed to take pay cuts and accept shares in MLG, which proved to be a boon for the workers. In addition to the incredible displays, films, exhibits and the exact replica of the fabled Montreal Canadiens dressing room, the Hockey Hall of Fame is rumoured to be haunted by a ghost. A disgruntled non-inductee? Not exactly. Steven Sandor stands on his head with this cannonading tour of Toronto’s rich hockey past and present. 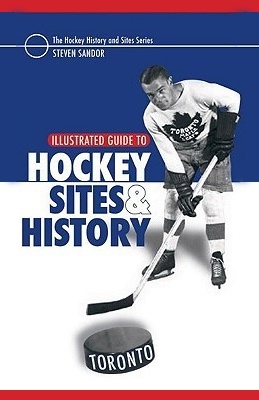 Combining entertaining stories with contemporary and historic photographs, the Illustrated Guide to Hockey Sites & History: Toronto shoots and scores on every shift. The stories break out fast with wonderful characters and trivia spanning over a century of hockey history. Maps and directions are provided for anyone who wants to come off the bench and visit the sites. Steven also recommends a few establishments around the city where healthy scratches can enjoy a beverage and watch the game. Paperback, 160 pages – Published May 1st 2007 by Heritage House Publishing Co. Ltd.